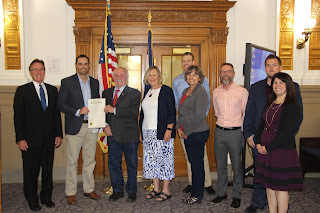 Today, the Mesa County Commissioners recognized the efforts and success of the Mesa County Workforce Center and other economic development partners for leading our community to be the first Work Ready Community in the state of Colorado. County Commissioners declare Mesa County as a Certified Work Ready Community and call upon all residents to recognize the Mesa County Workforce Center for their vital role in the economic development of Mesa County. Read the Work Ready Community Initiative Proclamation. Mesa County Workforce Center Director Curtis Englehart accepts the Work Ready Community Initiative proclamation in public hearing.